Help us get on Steam! We need your votes! $15 or more gets you Shovel Knight on a platform of your choice: PC ( Steam, Linux, Mac ), Wii U, or 3DS. PC or Wii U or 3DS, but not all. ... and the Digital Soundtrack will be released to everyone as Pay-What-You-Want upon release! But backers get it early! Update #17: Steam Time, Pulse Time, Box Time, Art Time... and Tinker Time! Update #7: New Tiers! New Options! Jake "Virt" Kaufman LIVESTREAM!! Update #4: Stretch Goals, Streams, and Wallpaper! 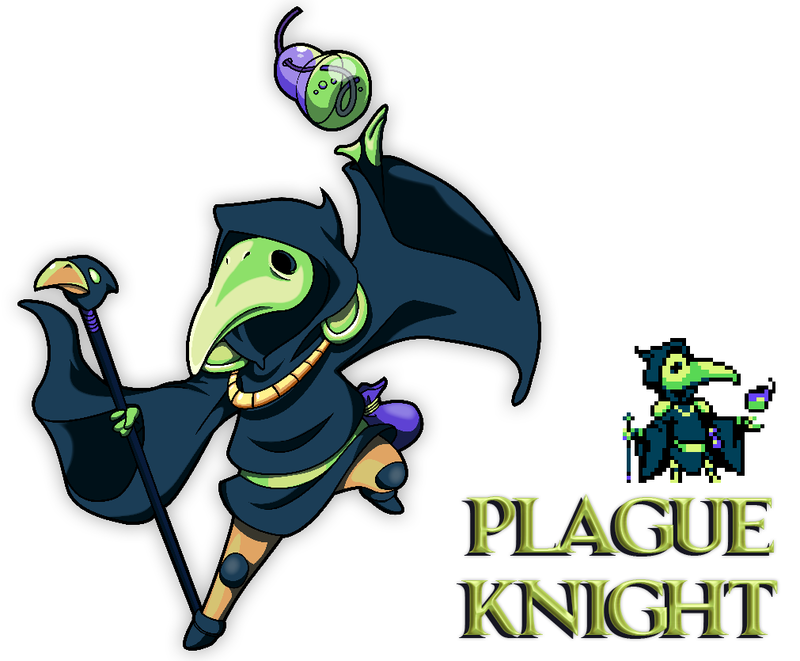 Update #2: PAX and Propeller Knight! Update #1: Shovel Knight coming to 3DS and Wii U!! Shovel Knight keeps digging right through those stretch goals! Thank you! Keep up the support and let's hit our next goal soon! Sound Test! Adds an in-game music player that lets you listen to all of your favorite Shovel Knight tunes. Collect song scrolls in the levels and take them to the bard, who will play them for you with perfect accuracy! We might even have some special, hidden songs... You’ll also be able to hear all the SFX samples, but we don’t know how the bard does that. We tend to like achievements because they change the way you play the game! This stretch goal will add a bevy of achievements to ALL VERSIONS of the game. These aren’t just going to be stock achievements; they will be creative and wonderful. Can you beat Shovel Knight without losing a life? Prove it! Start the game over with your weapons and items fully upgraded. However… enemies are going to be tougher, resources more scarce, and new challenges may arise. With new game plus, it’s like a whole new game! Kind of! +! Play the full game as a member of the Order of No Quarter! If we meet this stretch goal, we’ll hold a vote to see who it will be. Expect the game to play differently! For example, Propeller Knight could have the ability to hover for short distances, but would be a low health ‘glass cannon’ of sorts. Even the story and dialog will change a little bit to reflect the changes! Want to play Shovel Knight on your weirdo computer? Many folks have asked for Linux and Mac versions. We hope to support Mac and Linux either way, but this goal makes it happen for sure, and in a more timely fashion (hopefully in 2013!). We want Shovel Knight to be enjoyable by boys and girls of all ages, everywhere. With this mode, the main characters’ genders will be swapped, giving us a chance to do it before the internet has a chance to. The story will also change a bit to reflect the changes. Can you defeat the Evil Enchanter? Adds a comprehensive batch of challenge rooms to Shovel Knight. In this mode, Shovel Knight will be tasked with a variety of mini-quests like “defeat all the enemies!” or “reach the goal in time!”. Expect things like pacifism challenges and other rules-benders… and expect some tough-as-nails challenges too! · Cash collecting, where you fight for treasure that appears in the level. Knock your buddy to make gems fall out and collect them! · Last man standing, where the only goal is to slash mercilessly… to the bitter end! *This is couch co-op only, not online. We hope to bring this feature to all platforms, but the 3DS isn’t guaranteed because multiplayer is Wi-Fi only. Call this goal unoriginal, but we don’t care. We’re too excited to play as another boss knight! Let’s get to this pledge level and have one more knight (who will be chosen by the community) make the cut! Rally! For the Order of No Quarter! All Bosses Playable in Battle Mode!! If we reach this goal, the entire Order of No Quarter (including the Enchantress herself!) will step into Battle Mode, for the ultimate battle royale. Wild new combat styles abound! Play as your under-appreciated favorite and beat up the more popular knights that got voted into the main campaign! If you love games with perfect platforming, beautiful art, infectious music, crazy bosses, and real heart… Shovel Knight is for you! If you don’t, then what? How could you not be into that stuff? Keep reading, you’ll come around! Every great game needs a great set of baddies, and Shovel Knight’s are a doozy. Shovel Knight’s Nemesis is The Enchantress, a mysterious and powerful conjurer. Her Order of No Quarter has swept over the land, stationed in locations Shovel Knight is sure to visit. In order to get to the Enchantress, he’s gonna have to beat them all! We love themed bosses and themed levels; this love is on full display in Shovel Knight! Each knight in the Order has been lovingly crafted to have a distinct look, theme, and personality. These epic boss battles are really going to shine! We already love our villainous bunch, so let us share them with you. • Pros: Wields Snow Shovel, Doesn't feel cold but is quite considerate! • Cons: Annoying laugh ( it's like water torture )! And Propeller Knight! He commands the Enchantress' flying machine with the cocksure attitude of a sky pirate! With his Heli-Helmet, he can zoom short distances with ease. Shovel Knight encounters Propeller Knight on top of the aircraft as it zooms through the sky; earth fights against air in a true battle of elements! Mole Knight... the shovel may rule the confines of man-made gardens, but in the wild, the titan of tunneling is the mole! Mole Knight embraces this truth wholeheartedly. With his modified drop-forged armored claws, he mockingly tears through the earth with brute strength! Mole Knight calls the subterranean Lost City his home... an ancient abandoned metropolis. Shovel Knight must pass through the Lost City, but chances are slim he won’t be challenged to see who is truly the master of digging. Tinker Knight! Some knights love rushing into the glory of battle, ready to crush the skulls of their enemies! Tinker Knight is not one of those knights. He does his fighting before the battle begins, laboring on diabolical devices that do his work for him. The wrench is the tool of his trade, doubling as an engineering device and a melee weapon. Some are quick to dismiss Tinker Knight’s lethality... usually just before falling victim to one of his mechanical monstrosities! We’re going to be sharing more of the Order of No Quarter as the Kickstarter proceeds, so check in often! Shovel Knight is rendered in a pumped-up 8-bit style. We are adhering to the NES color palette, but adding many modern touches. For example, We have tons of scrolling background layers, giving a real illusion of depth. Our pixel animation and attention to detail is top-notch. Every character, even minor foes like these wizards, have painstakingly crafted animations and personalities. Detailed, living backgrounds and animation! Big, beautiful pixels! Just look at the screens!! With Shovel Knight, we are developing a next-gen 8 bit game! Like all of our favorite games, Shovel Knight has been designed gameplay first! We are especially dedicated to precise control. Pixel-perfect hit boxes, toenail jumps, and mobility mastery are our obsession. That wonderfully elusive 'feel' of great control. Great music is central to great games, so it’s with incredible excitement that we can announce that Jake “Virt” Kaufman is composing the soundtrack for Shovel Knight! For those of you who don’t know, Jake is one of the most talented audio guys in the game biz, contributing on games from Mighty Switch Force to Contra 4 to Shantae. His most recent work on Double Dragon Neon has garnered as much praise as the game itself! True to our sense of collaboration, our team likes to involve audio early and often in development. For Shovel Knight’s music, we’re taking an NES+ style approach, adding sound channels and detail for a fuller sound that’s still authentic. In addition to the main theme highlighted in the trailer, check out the track written for Pridemoor Keep, the level we’ll be debuting at PAX! If you liked that, you should just go listen to everything on his website (virt.bandcamp.com) because it’s amazing. And check out the Official Shovel Knight Soundtrack Album backer reward below! WE LOVE JAKE! Yacht Club Games is an independent game developer started in 2011 by Sean Velasco and a crew from WayForward. We are a fun-loving bunch of gaming geniuses who have dedicated our lives to video games ever since we saw our first pixels. However, our serious and solemn goal is to make really awesome original games that fuse modern and retro sensibilities, and we have the pedigree to prove it! Our team is comprised of top talent that has worked on some amazing titles, including Contra 4, A Boy and His Blob, Thor: God of Thunder, Mighty Milky Way, BloodRayne Betrayal, and most recently, Double Dragon Neon.This is our maiden project as Yacht Club Games, which means we are determined to impress. So what are we all about? We want to create fun and challenging gameplay. We want to both tug at your heartstrings and delight you with levity and charm. We want to make games that you play together with friends and family. Most of all, we want to give everyone the same collective types of game experiences that have defined our generation. It’s such an exciting time to be a fan of games; the industry is experiencing a renaissance and creativity is flourishing. We are so, so excited to develop games that we love, in hopes that you love them too! Shovel Knight is currently nearing the end of preproduction. This means that the game design has been written, the main character designs and story have been created, and we have a plan for moving forward. We have an early build of the game that proves out our game mechanics and technology; you can see some footage in the trailer and we'll also be at PAX East! However, many things are still up in the air. Enemies and objects need to be designed and drawn. Audio, Animation, and Backgrounds need to be crafted. Lastly, we need to polish everything to a mirror sheen. Basically, we have what you saw in the video. Now we need to make the whole game. So, we think this is a great time in the process to involve the community. We have a skeleton to build on, but we want you to be the meat! Video games are expensive and time-consuming to develop, so the usual way to get one made is to acquire funding from a publisher. We have had great partnerships with publishers in the past. However, working with a publisher has its drawbacks; you are beholden to them, and they are generally risk averse. We wanted to go to the community, because Kickstarter provides us a unique opportunity to interface directly with our fans and make a game where fun and quality are always the top priorities. We believe in Shovel Knight. We know that the final game is going to be great. We’re so sure of this that we quit our full time jobs to work on it. We’ve poured a massive amount of time, money and effort into our labor of love, but it’s not enough to finish the game. In order to make Shovel Knight a reality, we need you! We have amazing rewards that we are as excited to give out as we are to make! Check ‘em out below! Get a digital PC copy ( PC, LINUX, MAC, STEAM ) of Shovel Knight, hot off the digital presses! Digital! Also, ALL pledge levels $15 and above will be able to choose on which platform they want their stalwart blue hero!!! The final Instruction book will have illustrations, not sketches! Ah, the Instruction Booklet… the comfort food of books. We still have a few of our favorites, the pages worn and cramped with notes. Together with you, we can bring the lost art of instruction booklets back to the limelight! The Shovel Knight Instruction Booklet is full of important safety information, awesome character art, enemy lists, hints, and space for notes. We are taking the utmost care to make sure that these booklets are true to their predecessors, right down to the way they smell. We want the kids of today to feel the excitement of reading the booklet in eager anticipation of the game’s release, so we are going to send you the booklet FIRST, so you can read it and reread it, and go crazy with anticipation! This is a Book of the Game! The goal is to make something fun and funny, an entertaining compendium of the whole Shovel Knight production. Design Discussions and sketches! Concept Art and Illustrations! Game Maps, pixel animation sequences, and work-in-progress versions of everything! As we develop Shovel Knight, we’ll be chronicling the process and we want to put it all here on display. As a crazy indie startup, you know there is going to be a lot of juicy stuff! We already told you how awesome Jake Kaufman's music is. Hopefully you are thinking that Shovel Knight is looking pretty awesome too. Well, now you can own the combined awesome with this pressing of the Official Shovel Knight Soundtrack! Laid delicately into a bejeweled case, this CD and accompanying liner notes will be adorned lovingly with customized art. This is what you want. It’s what we want! It’s what we all want!! This is the best product photo ever, bwahaha! Own a real piece of the Shovel Knight Saga! At this reward level, we will hand-sign and deliver a handsome, wax-sealed envelope filled with Official Shovel Knight Dirt. We have obtained dirt ( at no small expense, mind you! ) from each area of Shovel Knight’s Kingdom; Gearwork Dirt from the base of the Clockwork Tower, Besmirched Dirt from the Village of Plague, and more! The dirt you receive will be chosen at random, but trust us when we say that all of the dirt is very special. Get it fast, because when it runs out, it’s gone. We’re not made out of dirt here! Now you can take part in our design process! We will be broadcasting on a private video channel available only to our beloved Kickstarter backers! You can be a fly on the wall and listen to us as we hash out the finer details of the design and work through problems, or you can jump in and tell us what to do! There is no guarantee we will listen, but many can attest to our receptiveness to ridiculous ideas. Budding game designers, armchair directors, and trolls can all have lots of fun! The Yacht Club loves index cards: we use them to quickly communicate ideas! Puzzle setups, boss patterns, and sketches of new enemies; they are hastily scribbled onto cards and passed around! It’s completely awesome, and it also means that by the end of a project, we have a lot of really cool index cards lying around. We are going to send you an original one of these cards! You can specify if you want a design card or an art card. Maybe you’ll get the very first sketch of an enemy that's in the final game! Appease your ego by having us painstakingly hand-craft a pixel version of you, which will appear somewhere in Shovel Knight. Send us a photo and we will recreate you in 8-bits and immortalize you forever… but where will you appear in the game? We know where we are going to put you, but it’s a secret for now! This is a really super high-quality 24x36 poster, signed by the team and sent to you. Suitable for framing ( you had better frame it! ), this poster will feature the classiest art we have by the end of the project. Come to sunny Southern California ( or if you are already here, just drive over to us ) to meet and spend the day with the Yacht Club! We’ll do a studio tour, get a fancy meal (or drive-through if you don’t have a collared shirt, but you can order whatever you want and we'll get like a whole extra bag of hot sauce), and then go back and play games for as long as we can stay up! Maybe we could also wear our jammies and talk about who we have a crush on! Oh, or if you would rather not, that’s ok too… we’ll take our cues from you I guess. If there is anything the Yacht Club loves as much as making games, it’s partying hard to celebrate a game launch. At this reward level, you will join us in SoCal with other Yacht Club superfriends on an hours-long voyage in celebration of Shovel Knight’s release! All of this is going to be on a Real Yacht on the Real Ocean, which we will be renting for the occasion ( the yacht, not the ocean ). Listen as we regale you with tales of the game dev trenches! Stumble about as you try to get your sea legs! Sing karaoke and be merry, because tonight, my friend, we are all superstars! Did I mention our special musical guest Jake “Virt” Kaufman, who is going to play live? It’s gonna be epic as hell. You should totally come. Follow us on Facebook! If you'd like to support us, liking and sharing us would be very appreciated! Follow us on Twitter! We always have something dumb to say! Watch our YouTubes! New videos and other excitement will be posted here. Making great video games is hard. Like, really hard! Art, design, and technology have to be blended seamlessly to create a cohesive experience. On top of that, it takes time to iterate and expand on ideas. There is a reason lots of awesome games take forever to come out! The biggest risk is that Shovel Knight would take longer than anticipated. If production were to go late, cash would be the biggest problem. If catastrophe truly struck, our backup plan would be to pool our remaining funds and partner with venture capitalist or publisher to get the game done. This game is our livelihood, so we will do whatever it takes! However, perish the thought of failure! Yacht Club Games has an experienced staff that has shipped more than 30 projects on more than 8 platforms. We work as a team, we have made games of this type before, and we know what we are doing! Get a digital copy of Shovel Knight for PC, hot off the digital presses! PDF instruction booklet + Digital Copy of Shovel Knight! PDF coffee table book ( great for your digital coffee table )!! + PDF instruction booklet + Digital Copy of Shovel Knight! Get a printed instruction manual!! + PDF coffee table book ( great for your digital coffee table )!! + PDF instruction booklet + Digital Copy of Shovel Knight! Shovel Knight Official Soundtrack Album + printed instruction manual!! + PDF coffee table book ( great for your digital coffee table )!! + PDF instruction booklet + Digital Copy of Shovel Knight! Take part in design meetings and hangouts, and tell us what to do! Or just listen. Plus, all previous rewards! Get hand-signed, official Shovel Knight Dirt, plus a secret that only you will be told! Plus, all previous rewards! SUPERDELUXE DIRT! Get hand-signed, official Shovel Knight Dirt (from our second shipment), plus a secret that only you will be told! Plus, all previous rewards! Super index card! A card with a design idea or concept drawing on it. You can choose design or concept! Plus all previous rewards! Your face in the game! At least, a pixel version of you. You aren't gonna know what we do with you until you see it in game, but it's gonna be good. Plus all previous rewards!! High-quality softcover Shovel Knight coffee Table book... So awesome. Plus all previous rewards! Super Deluxe movie-style poster, featuring the lovable cast of Shovel Knight signed by the team. Plus, all previous rewards! Deluxe luster finish, Hardcover art book. This is the one that you pass down for generations. Plus, all previous rewards (except for the softcover art book, you don't need two of those)! Become Director for a Day!! Plus, all previous rewards!